This product can only be purchased by members. To purchase this product, sign up by purchasing TattooMachineSupply.com Membership, or log in if you are a member. 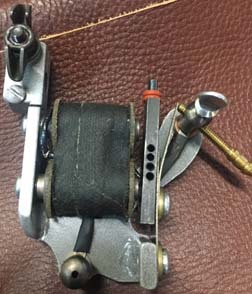 Nothing says tattoo machine more than a REAL industry standard. The Walker machine was passed down to Rick Cherry through his mentor Johnny Walker during his apprenticeship. If there is a Human walking the planet that has the Right to build this tattoo machine as a “walker” it is Rick. Best get one soon, Rick is getting old and grumpy cant say that he will want to make too many more.